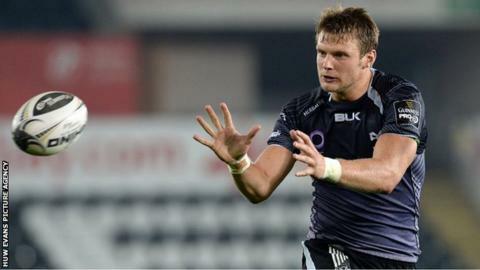 Dan Biggar says Ospreys must keep their feet on the ground after making a flying start to the Pro12 season. The Swansea-based region have scored 16 tries in three wins that have taken them to the top of league. But, after contributing 16 points to the 62-13 thrashing of Edinburgh, Wales international Bigger, 24, warned tougher tests are to come. "It's been a great start to the season, but we just need to push on now," said the 25-times capped fly-half. "We know that we're going to play better teams, and we know when we go away from home like we did last week we're going to have to play a lot better. Ospreys move back to the top of the Pro 12 with a nine try demolition of Edinburgh at the Liberty Stadium. "Munster next week will be a real test for us, we know we're going to have to step up. Let's not get carried away with the start." The one-sided demolition of Edinburgh means Ospreys are unbeaten in the league ahead of their visit to Munster on Saturday, 27 September. Their impressive form has confounded some pre-season predictions which claimed Ospreys might struggle after a number high-profile players left during the summer. British & Irish Lions Adam Jones (Cardiff Blues), Richard Hibbard (Gloucester), Ian Evans and Ryan Jones (both Bristol) all departed during the close season. Promising Wales international utility back Mathew Morgan also joined Bristol - a move announced before his call-up for Wales' summer tour of South Africa. Biggar said proving the critics wrong was not a motivation for the players. "We're just trying to keep our heads down and go about it," he added. "Everyone's entitled to write what they want and say what they want, but we've stuck together, we're a close-knit group. "We have to keep our feet on the ground and make sure we're going to Munster next week to grind a result out." Munster have already lost at home this season, 14-13 to Edinburgh in the opening round of matches.